Heat 1 Tbsp. oil in a large skillet over medium-high. Cook half of mushrooms, without stirring, until golden brown underneath, about 2 minutes. Toss and continue to cook, tossing occasionally, until browned on both sides, about 3 minutes more. Add 2 Tbsp. butter and 2 thyme sprigs to pan. Cook, tossing occasionally, until butter browns and mushrooms are dark brown and very tender, about 4 minutes longer. Season with salt and transfer to a plate. Repeat with 2 Tbsp. butter, salt, and remaining oil, mushrooms, and thyme. 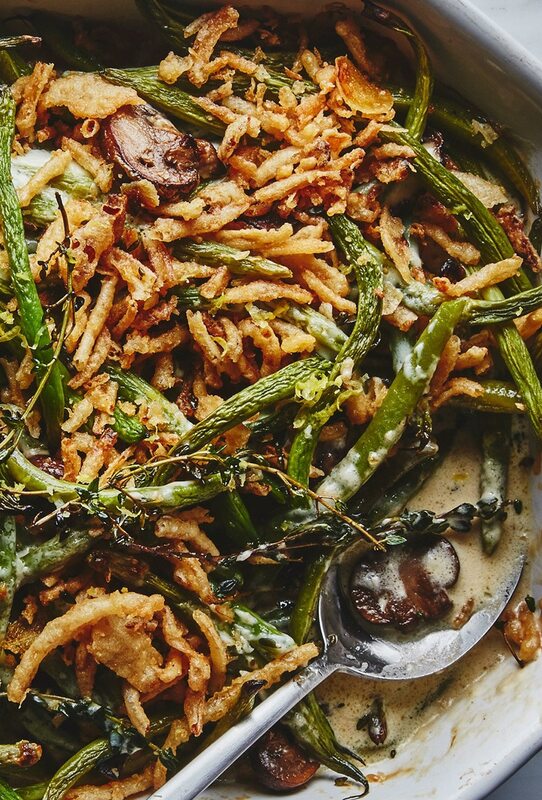 Arrange green beans and mushrooms in a 2-qt. baking dish. Pour sauce over (it may not look like enough, but it will get saucier as it bakes). Cover tightly with foil and bake until sauce is bubbling, 25–30 minutes. Uncover and continue to bake until casserole is lightly browned on top and around the edges, 15–20 minutes longer. Top with fried onions and continue to bake just until onions are slightly darker and fragrant, about 3 minutes. Let sit 10 minutes to set before serving.